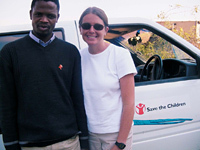 Kellogg Corps participants bring their management and leadership skills to international nonprofit organizations, including a 2002 stint in Swaziland, Africa, with Save the Children. "Doing well by doing good” is a philosophy embraced by Kellogg School students in a variety of the charitable work they do, including their efforts as part of Kellogg Corps, a program that creates opportunities for recent Kellogg graduates to volunteer their time and leadership expertise by helping nonprofit organizations in developing countries. Now in its eighth year, Kellogg Corps is unique among MBA programs worldwide, and has made a real impact utilizing the skills of Kellogg grads in areas as diverse as eco-tourism, market research, MBA curriculum development and microfinance. Since being founded in 1996 by three Kellogg School alumni, the program has sent more than 250 participants to 33 nonprofits in some 30 countries. The program has worked with organizations that include Africare, Save the Children, World Vision and the World Wildlife Fund. This year, student organizers strengthened Kellogg Corps’ resources by increasing the number of co-chairs to 10. These people coordinate project development, fund raising, marketing, finance and strategy. In addition to attracting more than three dozen volunteers every year, organizing Kellogg Corps itself serves as a real-world training ground for students to master the challenges of leading a nonprofit organization. “The planning, attention to detail, and thoughtful communication required to build relationships with funders and advisers have taught me more about running a nonprofit than I would have gotten in a classroom setting alone,” says Neel Shah ’03, fund-raising co-chair for Kellogg Corps. This year has been particularly challenging for the organization, given heightened security concerns about sending students to work abroad, not to mention the difficulty of finding financial sponsors during an economic recession. However, the needs of nongovernmental organizations in the developing world are more pressing than ever, which has kept the project development co-chairs busy. Every year the co-chairs organize a rigorous application process for prospective host organizations, during which they must specify how they would leverage the skills of four or five Kellogg MBAs during a four-to-six-week period. “Finding worthwhile projects requires months of planning and careful selection,” notes Andy Brown ’03, a former Peace Corps volunteer. At the end of that process, the co-chairs are still confronted with making “very difficult choices among host organizations that are all very deserving,” according to Lisa Hsueh ’03, a former Food for the Hungry volunteer. Like many student-led activities, an ongoing challenge for the group has been fund raising. As trips abroad often cost as much as $2,000 per volunteer — participants are expected to contribute up to half this cost — one Kellogg Corps activity has involved identifying new revenue sources. “In the beginning, we looked to recruiters for funding and even tried to trade airline miles for dollars,” recalls O’Connor. More recently, Kellogg Corps has relied on sources as diverse as private foundations, corporations, and other student-run Kellogg clubs. Today, as a managing director for Motorola Ventures, O’Connor helps identify multinationals with activities in developing economies who might support Kellogg Corps with corporate grants. Students are also working with Kellogg Professor David Messick, co-director of the Kellogg Ford Center for Global Citizenship, to obtain funding for projects related to the natural and social environment. Find out more about leadership opportunities available through Kellogg Corps at their Web site.